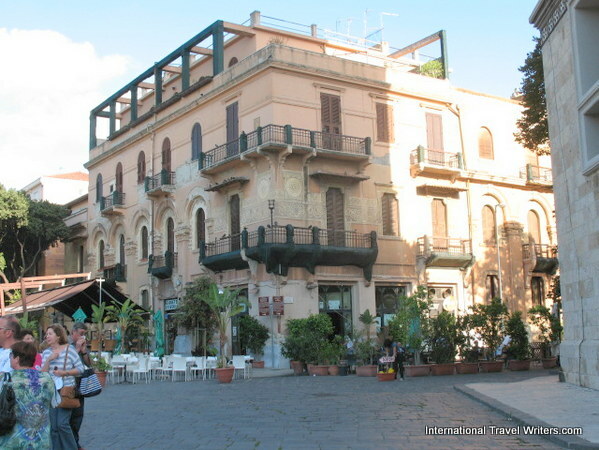 Piazza Duomo is the main square in Messina, Sicily and it contained some marvelous structures that had been restored, repaired or replaced over several centuries. The square is also known by the name Cathedral Square. 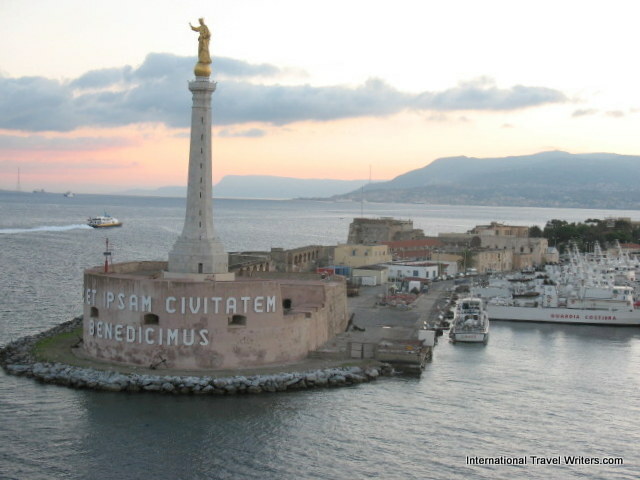 We opted to take the tour called Highlight of Messina (the list is on page called Messina). One of the major highlights was the Cathedral of Messina which dates back to the 12th century. It contains the remains of King Conrad, ruler of Germany & Sicily in the 13th century. 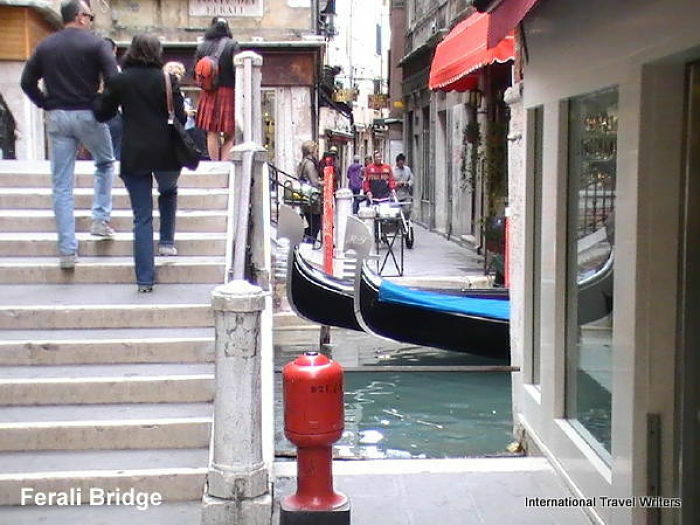 It has been rebuilt several times because in 1908 there was an earthquake that did heavy damage and during the Second World War it sustained further damage. Even with the renovations that have occurred, it has retained some of the original Norman-style features from 1160, when it was built by the Holy Roman emperor Henry VI. The Cathedral of Messina was originally built back in the days of the Normans but in 1197 it was dedicated to the Virgin Mary. Little of the original church remains but Valenti attempted to reconstruct in based on ancient documents so we assume a resemblance exists. 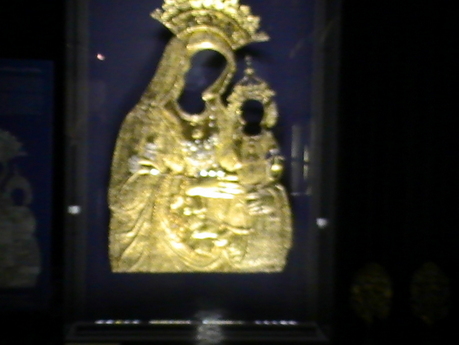 In the entry is a statue of Madonna and Child that dates from 1534. Piazza Duomo is where it is located. Along the walls of the side naves are statues representing the Apostolates. A highlight inside the Cathedral is the "Cloak of Gold" which weighs 20 pounds and was made by the Florentine Innocenzo Mangani in 1668. Adorning the artwork is a vast quantity of precious stones and jewels. 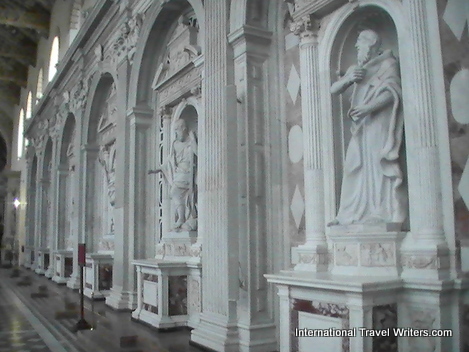 It used to cover the picture of the Madonna della Lettera on the Cathedral's high altar. 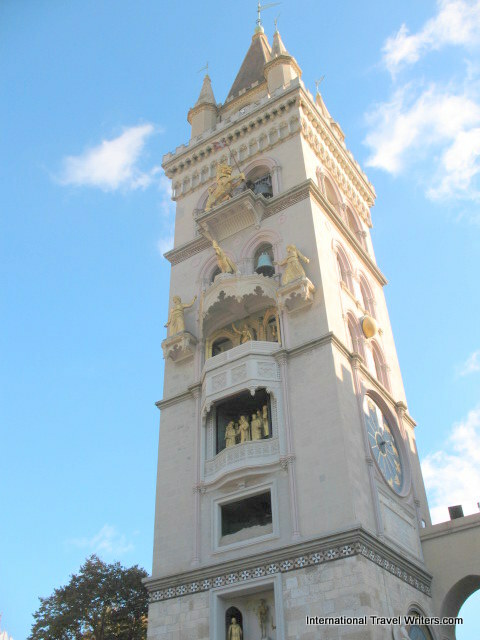 The ancient belltower also suffered severe damage in the earthquake of 1783 and a new design was done by Valenti. 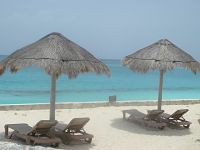 He tried to retain some of the characteristics of the former tower. In 1933 it became the awe-inspiring 197 foot tower that it is today with the addition of the largest animated astronomical clock in the world which was built in Strasbourg. It has a prime setting in the Piazza Duomo. 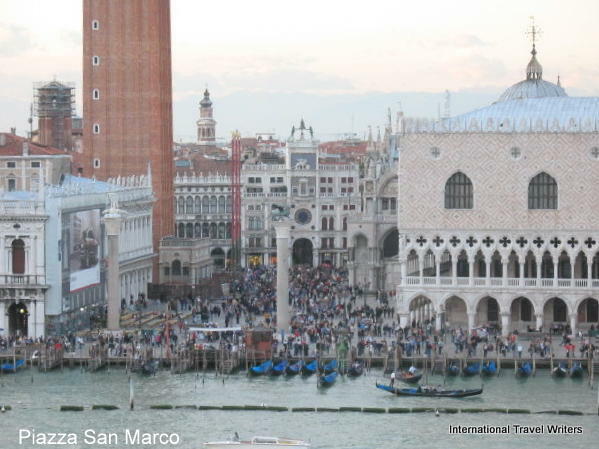 Crowds gather daily at noon to watch the spectacle. 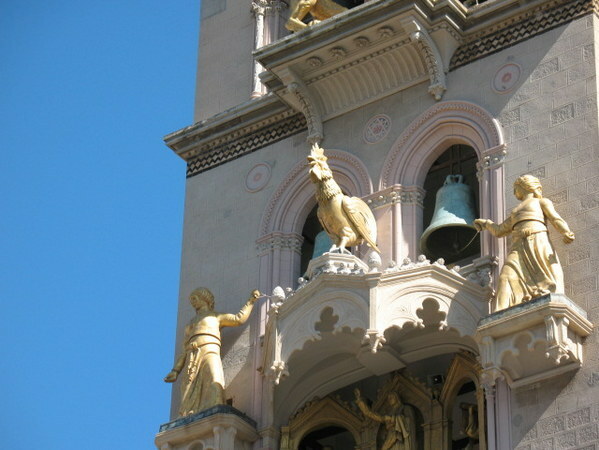 While Ave Maria plays from a loudspeaker, the bronze mechanical figures start their ritual. 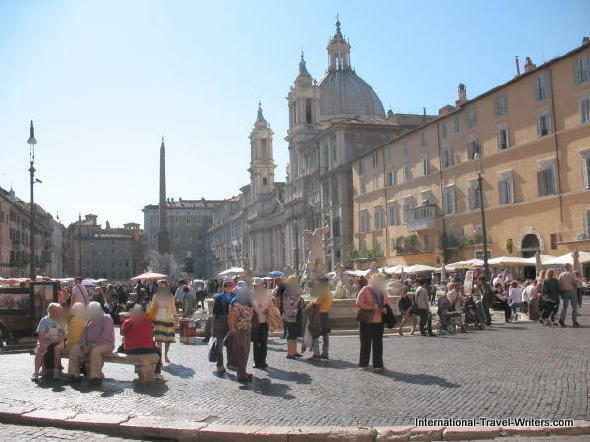 The Piazza Duomo becomes alive with not only the ritual but also with vendors selling handmade lacework and shawls. I bought a few shawls for friends because they were so exquisitely handcrafted. 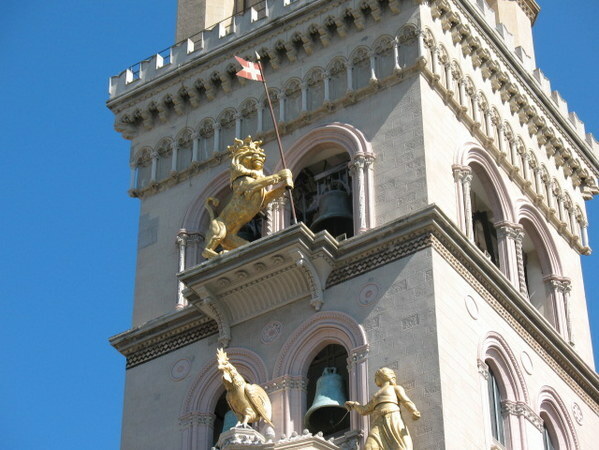 A bird flaps its wings, a lion roars and moves a flag, and two historical females take turns ringing the bell. Just before the end of the ritualistic sequences, a statue of Jesus appears from a tomb. Eight bells then toll the conclusion of the noon event. Orion Fountain (Fontana di Orione) is the work of artist Montosoli and was built in 1547. 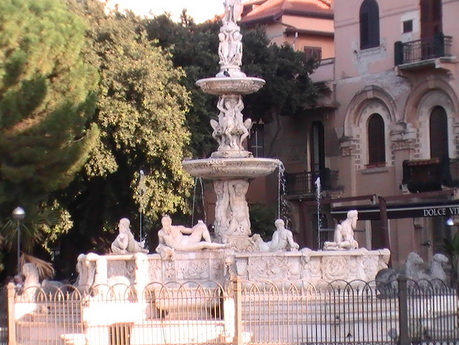 This pre-baroque style fountain was to celebrate and commemorate Messina's first aqueduct. It is named in honor of Orione, the city's mythical founder. It features the four rivers, Tiber, Nile, Ebore and Camaro as symbolic entities. 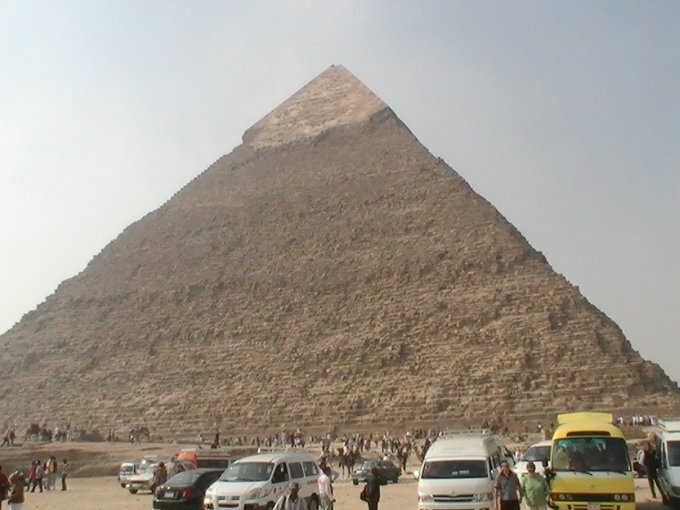 It has several levels and each one holds a different display with a separate meaning. The bottom has a two-horse chariot driven by a god and this indicates the day of the week. The next level has a figure of Death waving a scythe at the "four ages of man" represented by a child, youth, soldier or old man. The next level is the Sanctuary of Montalto and the figures represent the Nativity, Epiphany, Resurrection and Pentecost depending upon the season. 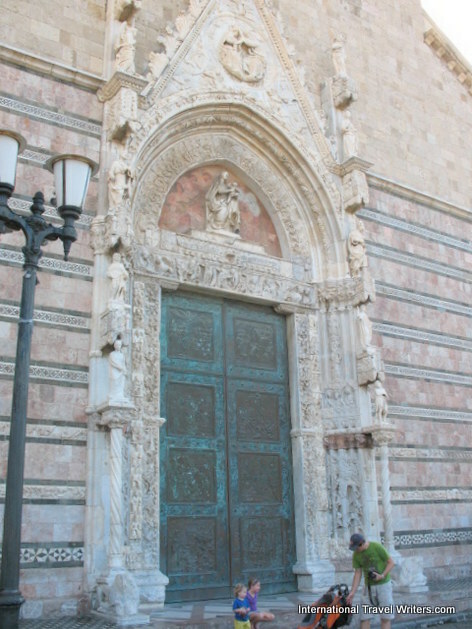 The top has Madonna della Lettera (Madonna of the Letter) in which a letter is delivered to the ambassadors of Messina thanking them for those who adopted Christianity.